Exactly what potential Nuclear Blast A&R saw in Wintersun - a duo featuring former Ensiferum's Jari Mäenpäa - when signing the band is a mystery. The Finnish act delivers a typical stew of Finnish speed metal enhanced by Malmsteen-esque soloing based on Classical music, but watered down by the usual amount of keyboarding prevalent in this country. It is indeed routine stuff when a Finnish band features folk-inspired melodies, a bunch of keyboard overtures and a delusional belief within the band that the delivery is original, interesting or indeed even metal! Past the standard comparisons to Children Of Bodom, Charon, Imperanon and the ilk song number five Death And The Healing is reminiscent of Amorphis and the next track Starchild is quite clearly copied from Blind Guardian. One assumes this type of pomp rock has fans in a few quarters otherwise labels would stop releasing albums like this. Then again, those fans are assuredly not metal listeners. 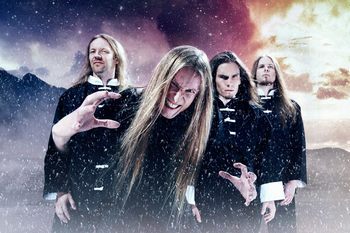 Wintersun's music is very much like the band's name: weak and ineffective. - Ali "The Metallian"